← How Charlie Chaplin overcame poverty to become Comedy King? Kulandei Francis was born to uneducated parents in Karipatti village near Salem. He was eldest of the six children. His father, Kulandei, an agricultural coolie, doubled up as a Railway Gangman while mother Mathalai Mary was a farmhand. She tired her hands at milk and rice business in a small way to augment the family income. ‘I am the only person from our family to enter college and it was mother’s desire. But, to complete my B.Com degree from Annamalai University, Chidambaram, she had to dispose of the little bit of dry land to pay for moneylenders”said Francis.. He was the only one of his siblings to earn a degree. Fresh from college, Francis’ was not keen on getting a job. ‘Starvation, misery and migration stalking the country side occupied my mind and forced me to do something for their welfare,’ he reasons. As such, he wanted to join the priestly order to engage in the uplift of poor and chose the Holy Cross Society in Bangalore in 1971 and completed Theological studies at the De Nobili College in Pune. For the regency, a period of training, he and two of his colleagues opted to work at the remote Sesurajapuram village for one year in 1975. “Then, there were no roads and we have to walk 20 km in the thick forest. But, we stayed there, conducting night school to the kids besides taking up other ecclesiastical work,’ he recalls. “During my priesthood, I became part of Caritas India’s (social service wing of catholic Bishops Conference of India) charity works and was assigned to work with famine hit people in West Bengal, who were displaced from Bangaldesh following the 1971 war. Then I worked with NGOs in Pune and Trichy and landed finally in Natrampalayam to devote myself to liberate people from money lenders,” says Francis. But in 1977, he left the order and became a full-time social activist. Though Francis left the Holy Cross Society subsequently, he asserts that it offered him enough insights to take up his social work. After getting trained at an NGO in Trichy, in 1979 he registered his own, the Intergrated Village Development Project (IDVP) to work from Krishnagiri. How did all this start? What inspired you ? It was 1975, and I heard about poverty and starvation deaths in many rural areas. One in particular was in a reserve forest, and you had to walk 20 km from the nearest town, Anchetti, to reach the village . I was appalled by the poverty. People were eating roots and whatever they could find on the forest floors, many were ill and unemployment was a reality. The area would get rains, but the water would run off, leaving the area dry and parched. I began in a small way, established a school, got the community interested in check dams and bore wells, and after three decades we have over 200 wells in the area. Q: What made you choose such a life? You are a graduate, and a priest as well, you could have opted for a regular job? Poverty is something I know first hand. I myself come from a very poor family. I was the only one in the family to be sent to college, there was no money for the others. My family was also caught in the web of money lenders. I wanted to help families such as mine, and I joined the Holy Cross to train as a priest. I found that I could not reach out to as many people as I wanted, and so I chose to get into the field and do things first hand. Francis began Integrated Village Development Project (IVDP) in 1979 a Tamil Nadu based self-help group (SHG) which provides help to the poor, students and women among others. IVDP started out with small projects like conducting night schools in the light of gas lamps and setting up a first-aid centre. IVDP is majorly into SHG, health and hygiene and education. Later, with the help of development organisations, he undertook a micro-watershed programme that, over 22 years, built 331 mostly small check dams, benefitting cultivators and their families in 60 villages. 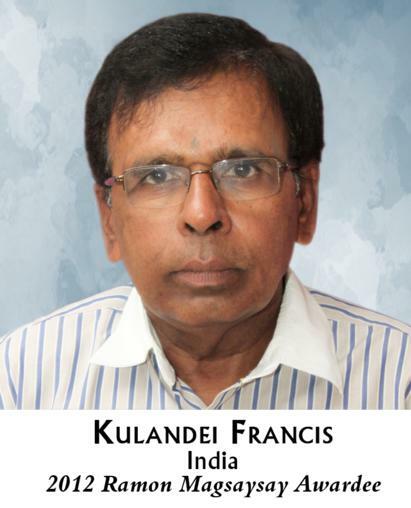 Kulandei Francis has won Ramon Magsaysay Award for 2012 due to his selfless service for the weaker sections of the society. Visit this link to view interview of Kulandei Francis. This entry was posted in Uncategorized and tagged Francis, Integrated Village Development Project (IVDP), IVDP, Kulandei, Kulandei Francis, Ramon Magsaysay Award for 2012. Bookmark the permalink.